Internal legitimacy, external recognition, and legitimate borders are the three elements that define a nation. In the summer of 2001, Afghanistan had none of these. By the fall of 2004, all three had been obtained. One of the CJSOTF-A contributions was to help legitimize the troubled and highly disputed Afghanistan and Pakistan border. The operation conducted to address border security was Operation Saratoga.27 Like Operation Trenton, Saratoga was a component of Ticonderoga, which involved reordering coalition forces along the Afghanistan and Pakistan border in order to improve unity of effort, command and control, and capability to deny enemy freedom of movement. Commencing in September 2003, the CJSOTF-A commander and his SF battalion commanders conducted a series of face-to-face meetings between Pakistan Ministry of Defense and Ministry of Interior officials responsible for sectors along the Afghanistan and Pakistan border, accompanied by local and national Afghan leaders. The purpose of these meetings was to start the long and deliberate process to codify the border and place responsibility for the management of the border with the appropriate authority. Up to this time, the border had been a point of friction and conflict between the two governments, complicating the ability of coalition forces to reduce or destroy the external source of support that was propelling the insurgency. Border meetings from the Chitral District all the way down to Skhin became routine, allowing for Pakistan and Afghanistan officials to determine how they would work locally to stem the insurgency. In March of 2005, as the success of the CJSOTF-A produced tactical success, the deputy commanding general of the CJTF 76 entered the process to move to the next level of operational and strategic success. The border meetings continued, but with the deputy commanding general. His active participation also brought in the emerging government of Afghanistan, which achieved the results desired: a recognized government of Afghanistan involved in cohesive conversations with the Government of Pakistan in recognizing and respecting the border. The means to do so was by military discussions on interdicting guerrilla cross border movement. Operation Saratoga had great political-military success at the operational level, while the SF battalion responsible for the border mission had success in the tactical mission. The critical aspect of Operation Saratoga became the availability of forces. In a number of ways, the CJTF 76 and the CJSOTF-A attempted to improve the border mission. At first, Afghan Security Forces augmented existing SF operating along the border by protecting the SF base camps, freeing up the coalition force to conduct operations. Next, the CJSOTF-A presented a series of plans to train, organize, and equip a border force, unilaterally or with the Government of Afghanistan and the Combined Forces Command–Afghanistan assistance, which the CJSOTF-A was to combat advise. Resourcing issues halted the full implementation of an effective Afghan border force. 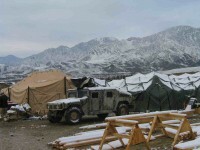 The CJTF 76 worked to reallocate Afghan Border Police to the CJSOTF-A for Operation Saratoga; however, that force was redirected to other security missions. Finally, a requirement for Afghan National Army battalions was put forward, but by December 2004, not filled. a. Enemy infiltration along Afghan-Pakistan border curtailed due to the relocation of four SF base camps along the border, creation of six border checkpoints, and the refocusing of half of the CJSOTF-A combat power to the border mission. b. Cooperation between the Governments of Afghanistan and Pakistan increased face-to-face cooperation and the establishment of the Tripartite Commission on border matters. c. Introduction of Afghan Ministry participation provided the first step in solidifying government of Afghanistan control of its border, replacing warlord dominance. It is easy to focus on combat operations, but our strategic objectives were two-fold: establishing security while helping the nation and its people. The next section discusses the nature of the planning and operations for civil-military COIN operations. Source: “One Valley At A Time” by Adrian T. Bogart III. Joint Special Operations University Report 06-6 (August 2006). pp. 67-69.